"Q A quick one on Lebanon, too. Prime Minister Siniora comes out today and says he has summoned the U.S. charg d'affaires to request clarifications about the USS Cole being sent to the region; says he had nothing to do with it. Was there really no coordination between the United States and Lebanon about this show of force in the region?
" Vilnai's holocaust threat, however much Israeli officials attempt to qualify it, fits into a consistent pattern of belligerent statements and actions by Israeli officials. Israel has attempted to isolate the population of Gaza, deliberately restricting essential supplies, such as food, medicines and energy, a policy endorsed by the Israeli high court but condemned by international officials as illegal collective punishment. As The Electronic Intifada has previously reported, dehumanizing statements by Israeli political and religious leaders directed at Palestinians are common (see "Top Israeli rabbis advocate genocide," The Electronic Intifada, 31 May 2007 and "Dehumanizing the Palestinians," Ali Abunimah, The Electronic Intifada, 21 September 2007)." My article in Al-Akhbar: "The Triumph of Sadatism: The country (and US) first." For knowledge on Iraq and Middle East issues, I always--ALWAYS--turn to her. "The Bush administration’s continued backing of President Pervez Musharraf, despite the overwhelming rejection of his party by voters this month, is fueling a new level of frustration in Pakistan with the United States. That support has rankled the public, politicians and journalists here, inciting deep anger at what is perceived as American meddling and the refusal of Washington to embrace the new, democratically elected government. John D. Negroponte, the deputy secretary of state, said Thursday during a Senate panel hearing that the United States would maintain its close ties to Mr. Musharraf." The dispatch of USS Cole to the waters off Lebanon was expected. You see, most of the Syrian and Iranian intervention in Lebanon has been arriving by sea. Also, members of "the democratically-elected" government of Fu'ad Sanyurah, may be forced to flee for their lives and the presence of those ships is very reassuring to them. O Arabs. Your money will be funding this library: "Mr. Bush’s library, which is to include a museum and a public policy institute, is expected to cost more than $200 million, though Mr. Bush said Thursday that he could not confirm that amount. He said he would “probably take some foreign money, but don’t know yet.”"
"“I was never on his show,” Gore Vidal, with whom Mr. Buckley had a famous feud, said on Thursday. “I don’t like fascism much.” He added: “I was one of the first people he asked. And, of course, I refused to be on it. And, of course, he lied about it afterward.”"
If Prince Harry joined the British military earlier, I am confident that he would have been able to save the British Empire. An American correspondent in the Middle East sent me this: "so LBC is starting a new show thats supposed to target youth and tackle social issues the episode they've been working on is about economic issues. they prepared a set of questions for the woman who is the economy and stockmarket expert for al arabiya. rather than asking her intelligent questions, one of them was "you sit with the kings of money, do you dream of being a queen?" then they arranged to interview a poor man who works with expensive jewelry. one of the questions they prepared to ask him was 'how much does it cost to say 'i love you''"
Barak Obama always brags that he worked as a "community organizer". Personally, I would much rather be a community disorganizer. Ibrahim Al-Amin offers a critical analysis of Walid Jumblat's political and psychological state. 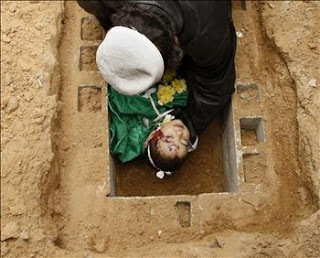 Today, the New York Times carried two pictures of victims in the Gaza bombings. Both were of Israeli victims. "Defense Secretary Robert M. Gates urged Turkish leaders on Wednesday to abandon their invasion of guerrilla-controlled lands in the northernmost reaches of Iraq by mid-March." It is over. The Taliban are now finished once and for all. Finally, a solution to the Taliban problem in Afghanistan. 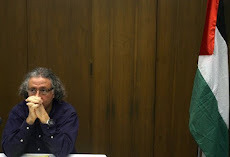 I watched an interview with Lebanese novelist, Rashid Ad-Da`if. What an unassuming and kind man. I was so impressed with his personality: very atypical of Lebanese intellectuals. Note to self: read his books NOW. I did not know that he was a member of the Lebanese Communist Party for 20 years. (For readers: many of his books are translated into English, French, German and other languages). The propaganda war in the current Arab cold war is so intense that it is only comparable to the Arab propaganda war of the 1950s between Nasser and his rivals. Almost daily, there are fabrications, allegations, and fake interviews from both sides (the Saudi and the Syrian). 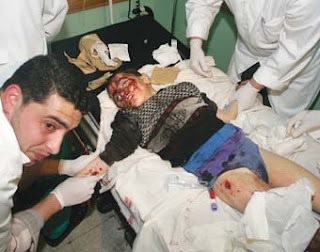 Another Palestinian child injured by Israeli bombing in Gaza. "An Israeli airstrike aimed at the ministry of interior building in Gaza City also destroyed the nearby Palestinian Medical Relief Society (PMRS) head office in Gaza and killed a 5-month-old baby in a residential building in the same area." Enslaved by a Lebanese family here in Modesto. "Jonathan McCullum was in excellent health at 155 pounds when he left last summer to spend the school year as an exchange student in Egypt. But when he returned home to Maine just four months later, the 5-foot-9 teenager weighed a mere 97 pounds and was so weak that he struggled to carry his baggage or climb a flight of stairs. Doctors said he was at risk of a heart attack. McCullum says he was denied sufficient food while staying with a family of Coptic Christians, who fast for more than 200 days a year, a regimen unmatched by other Christians." 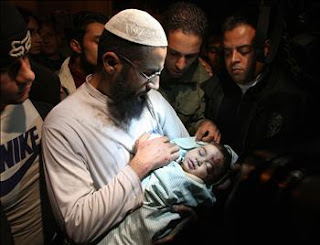 His baby, Muhammad Al-Bur`i, was killed by Israeli occupation bombing in Gaza. (Reuters). How I despise the Jordanian press. Instead of focusing on the ruling family and their machinations, today they united to publish a special message on their front pages regarding...Danish cartoon. Danish cartoons, for potato's sake. They said that the cartoons don't enter into freedom of expression. Maybe they should focus more on the denial of freedom of expression in their own country by their PlayStation monarch. "graceful, often self-deprecating wit that endeared him to others"
"Everyone detected with AIDS should be tattooed in the upper forearm to prevent common needle users, and on the buttocks, to prevent the victimization of homosexuals"
"[lined] up squarely behind Southern segregationists, saying blacks should be denied the vote. After some conservatives objected, Mr. Buckley suggested instead that both uneducated whites and blacks should not be allowed to vote." Today, I watched Sudanese demagogic dictator, Hasan Al-Bashir, rail against...Danish cartoons. Danish cartoons: the last refuge of Arab dictatorial demagogues. Zionist-Saudi Alliance. Today, MEMRI (and I, of course, would not link to them) issued a report in which it expressed its satisfaction with Saudi "anti-terror" campaigns. It said that Saudi Arabia will be praised for its public beheadings and for its funding and arming of fanatical kooks provided the government continues to align itself with Israeli goals in the Middle East region. The correspondent of the New York Times spent two days in North Korea. Don't be surprised if he soon signs a book contract to write a book about the politics and society of North Korea (especially the countryside where he did not visit but had some generalizations to offer). From most to least democratic. From Economist--the best magazine there is. "Immigrants in California are far less likely to land in prison than their U.S.-born counterparts, a finding that defies the perception that immigration and crime are connected, according to a study released Monday." "Khalidi said he supports Obama for president "because he is the only candidate who has expressed sympathy for the Palestinian cause."" When did Obama express sympathy for the Palestinian cause? Am I missing something? The standards of New York Times' obituary page. Arab writers, leaders, poets, and artists and barely a mention in the New York Times. Not a word, for example, on the passing of Suhayl Idriss. But today, they have a large obituary for a former Israeli army chief-of-staff (who knows how many innocent people he has killed over a life time). But anything that has to do with Israel, gets prominent feature in this paper. I swear: they once had an obituary of some chef: the headline said: he once worked in Israel. Qaradawi Channel. I woke up, put on the news on AlJazeera: they started with this: whether a German minister really called on European media to publish...Danish cartoons. Danish cartoons, for potato's sake. Then said that hundreds of thousands took to the streets in Khartum in protest. This gives you an idea how unspontaneous these activities are: the demagogic dictator of Khartun wants any issue to ride on. The demonstration looked much smaller than what was said about the number: but maybe they have the Hariri counters of demonstrations which multiply the actual number of demonstrators by 10. This reviewer of this book in Al-Akhbar failed to mention the most important part: that this is a classic anti-Semitic book. Dear readers and jerks: I have no rules to speak of for the comments section. I have insisted on not censoring comments as awful and offensive as they have been (from people on opposite sides as both sides have racists and bigots in their midsts unfortunately). But I have asked that people 1) observe the laws here in the US which prohibit death threats or calls for murder or violence; 2) that they don't use other people's names; 3) that they don't out other people who choose to write under other names--that is their right; 4) that they try as much possible to reduce the level vile expressions. It being clearly understood that the comments don't speak for me and don't represent this site or its owner. I write my opinions under my own name. The other Mughniyyah. There is a less famous member of the Mughniyyah family. Religious scholar Muhammad Jawad Mughniyyah of Tyre is an important figure in the contemporary history of Sh`iite religious thought. He wrote the book Al-Akhumayni wa-d-Dawla-l-Islamiyyah which was the first critical refutation of Khumayni's doctrine of Wilayat Al-Faqih. I noticed that the official announcement of the Yaser `Arafat Foundation in the Arab League in Cairo today included Lebanese Shi`ite cleric, Hani Fahs. His specialty is fatwas-for-sale, and will offer special courses in opportunism at the Foundation. On the clinical death of the Jordanian Communist Party. In celebration of the birthday of comatose Ariel Sharon, members of US Congress agree to move their toes in unison. "Israel Defense Forces troops killed a Palestinian farmer near the Gaza Strip's border on Tuesday, his relatives and hospital officials said." The correspondent of the New York Times has been in North Korea for 24 hours but he feels qualified to say this: "Malnutrition persists in the countryside." The other side of Dubai: "In a country where strikes are banned, the sentence issued by the Dubai Court of Misdemeanour against Indian workers reflects the coercive atmosphere that prevails in the country. The strikers were sentenced to six months in jail to be followed by their deportation for involvement in violent protests to demand pay increases last year." By the way, Arab media are reacting (and on front pages) with disgust over Clinton's latest dirty trick regarding Obama's picture in traditional Somali dress. (No, I am not endorsing Obama and still hope that Mr./Ms. Potato head run for president). Did you catch the press statement yesterday by Abu Mazen's Information Minister (former leftist, Riyadh Al-Maliki) when he criticized (on behalf of Abu Mazen's Council of Ministers) Palestinian demonstrations against Israeli occupation because "they put Palestinian women and children at risk"? A critical evaluation of Al-Arabiya TV (not as harshly critical as needed, in my opinion). "Lebanese professor of politics, As'ad AbuKhalil, of the blog Angry Arab, offered criticism of Arab news coverage of Obama. He wrote, "Al-Jazeera is covering Obama as if he is the political equivalent of Muhammad Ali." AbuKhalil also mocked the Islamophobia surrounding Obama, including e-mail campaigns insinuating he is a Muslim or attended religious schools. He joked that "the Clinton attack machine will now claim that Sen. Obama has pledged to ask Mahmoud Ahmadinajad to be his running mate if he wins the nomination." He compared the hysteria about Obama's religious background to Nazi persecution of Jews. "This discussion of whether Obama was ever a Muslim is not different from Nazi discussion of the Jewish heritage of certain individuals."" PS Here, the writer in this Turkish weekly misunderstood my last point. I would be insensitive to the victims of the Holocaust if I compare the prejudice regarding Obama's background to Nazi persecution of the Jews. I did not mean that. I meant that the discussion of Obama's background is similar to when present-day Nazis (or anti-Semites) discuss the background of a person to determine whether he/she is Jewish or not. 77.4% of all Lebanese Christians support "action for the overthrow of the Zionist regime" in Israel. A Saudi secularist describes his ordeal. "Most of the world's Internet users lost access to YouTube for several hours Sunday after an attempt by Pakistan's government to block access domestically affected other countries." The Libyan dictator's son is now negotiating with a Libyan Bin Ladenite group toward releasing their members from a Libyan jail. In other news, Western governments are now rushing to sell weapons to the Libyan government. Every few days, the Syrian government asks the Saudi government if it can send its foreign minister to present an official invitation to the Saudi King to attend the Arab League summit in Damascus. And every few days the Saudi government says no. `Amru Khalid, the Egyptian tele-Islamist, reminds me of the most corrupt of US televangelists. White males among Super Delegates of the Democratic Party are double their percentage among Democratic voters (I just learned that from the best magazine there is--the Economist). I read statements by the two Abu Mazen's ministers who submitted their resignations and still could not understand their reasons. They said that they were unhappy with the "situation." Can you please be more clear? An Israeli soldier died yesterday in...Baghdad. An Israeli newspaper said that he volunteered to fight with the US occupation forces. The Arab League will today officially open the Yaser `Arafat Foundation in the Arab League headquarters in Cairo. The foundation will train diplomats in the art of lies, deception, trickery, double talk, equivocation, unprincipledness, shiftiness, autocracy, and submission and prostration before foreign occupation. All trainees will have their certificates signed by Muhammad Dahlan. A Lebanese military court sentenced a Lebanese citizen for one week for insulting former president, Emile Lahhud, and current commander-in-chief of the Lebanese Army, Michel Sulayman. I am jealous of all of you who live in Boston. Mauritanian singer, Malouma, is coming to Boston. (I am grateful to Jamilah for introducing me to this great singer). "Mr. Abdul Raheem, the clothing store employee in Amman, said, “No one can be in the government now and be clean.” Meanwhile, his own life has been transformed, Mr. Abdul Raheem said. He ticked off a list of prices: potatoes have jumped to about 76 cents a pound from 32 cents. A carton of 30 eggs went to nearly $4.25 from just above $2; cucumbers rose to 58 cents a pound from about 22. All this in a matter of weeks." There really should be a loud campaign to show solidarity with the bloggers who are being persecuted and banned in places like Saudi Arabia, Syria, and Iran. It just hit me how annoying it must feel to be banned as a blogger. "By identifying Israel with the supposed underdog, ethnic Albanians in Kosovo, Haaretz implicitly recognizes that there are indeed some striking similarities though not ones it would acknowledge. Kosovo, like Israel, was illegally severed by force of arms from another country against the wishes of the majority population of the whole territory. Both entities came into being and can only survive with the sponsorship and support of the Great Powers of the day who sustain them in violation of international law because it suits their imperial interests. Furthermore, both entities are animated by a virulent ethno-nationalism that is fundamentally incompatible with the values of freedom, tolerance and democracy that they claim to have come into being to uphold. In this sense, Kosovo is the latest in a collection of Western-backed pseudo-states that also includes the Kurdish entity in northern Iraq." All Israelis are saying, is give war a chance: "Peace will return for his family, Peretz has decided, only if Israel chooses to go to war with his neighbors." "Israel's Beaufort fails to win Oscar for Best Foreign Language Film" Don't worry. I am sure that they will manage to give some award to the director: maybe a Nobel Prize in Peace or chemistry. "The demonstration was an unusual sight in the West Bank, where Abbas' Palestinian Authority has become increasingly autocratic since his Hamas rivals seized power in the Gaza Strip in June. Since then, police have cracked down on protests perceived to challenge Abbas' rule. Some 3,000 Hamas loyalists crowded the village of Kobar, carrying the body of 44-year-old Majed Barghouti, who died in a lockup run by intelligence officials on Friday, a week after he was arrested. Hamas officials said they did not trust a government investigation announced by Abbas." Forty days since George Habash died. Why do we mark forty days in the Arab world? What is the origin of that? Why not fifty or twenty? A beautiful tribute to Joseph Samahah. I saw Ma`n Bashshur on LBC-TV. I have to say this first. Bashshur belongs to a group of sincere secular Arab nationalists: there are people like Ma`n Bashshur and Kamal Khalaf At-Tawil who don't belong to sects or to narrow sectarian groups. These are people who you only know as Arabs and not as members of sects or Qutr. At the personal level, Bashshur is one of the nicest, funniest, amicable, civil, democratic, friendliest, and charming people. Even if you disagree with him--as I often do especially when he writes tributes to Saddam, you can't meet him and not like him. You would disagree with him and he would disarm you with his likable personality. Last time I saw him in Beirut, I was expressing my displeasure at a show he did with Joseph AbuKhalil in which he appeared uncritical of the latter. He said: you like eggplants. Let me tell you when Saddam Husayn would wink at me about eggplants. And he would proceed to recount a most entertaining story. But today Bashshur said, to the effect, that it is uncharacteristic of Saudi Arabia to interfere in internal Arab affairs. Come on. You know about the contemporary Arab history more than I do, and you have lived it. Has Saudi Arabia ever stopped in interfering (in money and arms) in the affairs of every Arab country since at least the 1950s? I used to think that there is no journalist who irritates me more than Al-Arabiya's Gizelle Khuri. There is: Ziyad Makhkhul of L'Orient-Le Jour. Saudi newspaper have been talking in the last week of an alleged miraculous incident. Allegedly, an illiterate Sudanese man memorized a third of the Qur'an. Not to be outdone, Lebanese newspapers will tomorrow report that a Lebanese man was able to memorize the phone books of every Chinese city. So there. "Three Palestinian men picnicking in a field in the northern Gaza Strip were killed Saturday by an Israeli tank missile, said a Palestinian official and relatives of the dead." Sharon Stone tells the Arabic magazine, Laha, that she loves the Arabian desert. (In 1993, Al-Hayat newspaper published a full page ad about a contest to select a name for a new Arabic women's magazine. The prize was a few thousand dollars. I sent offering the name, Laha, and even did a calligraphic design. I did not hear from them. They did not announce what happened to the contest. But a few years later, the magazine was launched with the name, Laha, and the calligraphic design was suspiciously similar to the one I had submitted). Look at this from the Saudi newspaper, AlRiyadh: "US Security Officials Praise the commitment of Saudi students." "British soldiers in Iraq may have tortured, mutilated and executed up to 20 Iraqi detainees four years ago, according to five Iraqi civilians who say they saw the murders." Taking time off from his PlayStation III: "Jordan's King Abdullah II has been touring South Africa on a Harley Davidson motorcycle for the past week, the Sunday Times of Johannesburg reported." "Senator Hillary Clinton won the Israel vote in the Democrats Abroad Global Primary, but was defeated in the international race by Senator Barack Obama, who captured the majority of the votes cast by American expatriates who voted in the Democratic Global Primary." Al-Hurriyyah magazine (the mouthpiece of the Democratic Front for the Liberation of Palestine) published in its issue number 1171 the full text of a Hamas proposal submitted to Abu Mazen to resolve the difference between the puppet president and Hamas. 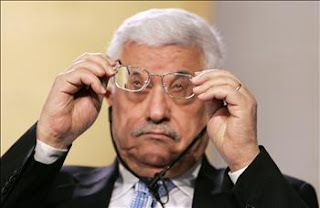 Abu Mazen turned it down. In fact, a Hamas spokesperson told Hamas TV that the movement is ready to apologize to Abu Mazen. The latter said that he does not have permission from Israel to forgive Hamas yet. In other news, Hamas is busy banning Palestinian (not to be confused with Danish) cartoons. ""I have found that at Princeton, no matter how liberal and open-minded some of my white professors and classmates try to be toward me, I sometimes feel like a visitor on campus; as if I really don't belong. Regardless of the circumstances underwhich I interact with whites at Princeton, it often seems as if, to them, I will always be black first and a student second."" 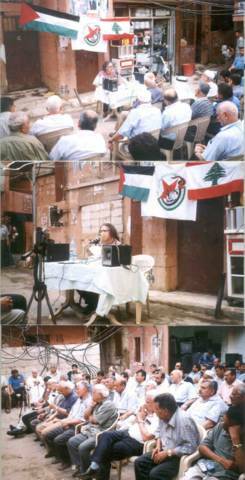 George Hawi's daughter (rightly) criticizes Hasan Nasrallah for ignoring Lebanese communist struggle against Israeli occupation. In the memorial for Joseph Samahah today in Beirut, I am told that Ibrahim Al-Amin shocked the audience. He revealed that the late Joseph was a friend of `Imad Mughniyyah, and that he was sitting next to him in that one picture of him that was released. "Bush library coming to SMU." It will consist of his comic book collection. On the contradictions of Arab liberals. I should point out that, for some reason, pro-Saudi Wahhabis now refer to themselves as "liberals" just as Bush is a uniter, not a divider. Conspiracy? What conspiracy? Hariri rag, Al-Mustaqbal, has this headline on the front page: "Tens of millions of US aid to West Bank and Gaza." Expect AlJazeera's coverage to decline further: Prince Sultan Bin`Abdul-`Aziz will be visiting Doha this week. Yesterday, AlJazeera carried a report about "demonstrations" against Danish cartoons in Islamabad although the correspondent admitted that there were only hundreds (they looked even less). Fu'ad Sanyurah's effort at feigning a fake British accent continues. I heard him speak in English from Berlin the other day, and he pronounced "unity" as "uniteeeeeeeeeeeeeyyyy." My article in Al-Akhbar: "The Return to the Armistice Agreement: Or the (Undeclared) Return to the May 17 Agreement". "The former head of the CIA, James Woolsey, is one of the unofficial members of his faction and he is a McCain backer, as is the columnist and editor William Kristol, and Robert Kagan, who was an adviser to secretary of state George Schultz, and most likely also his brother, Fred Kagan, who wrote the plan for the surge in Iraq, as well as McCain's official adviser on matters of foreign policy, Randy Scheunemann." Muhammad Dahlan declares his innocence. The further degeneration of Lebanese politics. I watched the speech by Nasrallah today. I could not believe it: he challenged the other side to a contest of demonstrations to verify who can bring more crowds to the streets of Beirut. I kid you not. How petty is that? I really feel that there is a growing segment of the Lebanese population who are fed up with both sides. If only they can organize, along secular lines of course. Lebanon would benefit greatly if we impose--even for one year--Turkish or Anver Hoxa's style secularism on its state and society. The religious police of Saudi Arabia issued a statement bragging about its accomplishment. It said that it undertook 1 million and 160,000 operations "in the service of society." Supporters of Nasser annually commemorate the date of Syrian secession from the United Arab Republic. But this was not a shining moment for Nasser: it was a confirmation of the lousy management of the unity experiment which later only fortified the most narrow forms of nationalism and ethnocentrism in the region. Let us also not forget the the dissolution of the Lebanese communist leader, Faraj-allah Al-Hilu in H2SO4. Of course, one has to also note the reactionary (and external) orientation of the coup plotters. US Presidential Politics. Ask Guiliani any question, and he talks about his "leadership"--I don't know what that refers to--on Sep. 11. Ask John McCain a question about his links to lobbyists (read the account about his role in Keating Five in today's New York Times--do you know that the crook, Charles Keating, was a great friend of Mother Teresa and she wrote letters to his judge on his behalf? ), and he asserts that he was proud to serve his country in the Navy. Ask Huckabee a question on health care, and he reminds you that he has visited Israel nine times. Ask Obama a question, and he denies being a Muslim. Ask Hillary a question, and she responds by insisting that she sides with both sides of any issue. Ask me a question, and I will yell at you. Today, CNN interviewed a Serbian nationalist professor (from Georgia State University or the University of Georgia). She was commenting on the Serbian mob that set the US embassy in Belgrade on fire. She said--I kid you not--that viewers should know that the "demonstration" by Serbs was "peaceful". I guess that the word mob can't be used when the White Man is involved. Foreign-maids-in-Lebanon-update. A maid from Nepal is hospitalized after "falling" from the house where she works. Typically, there will be no investigation by Lebanese police and Human Rights Watch is busy with the health of Muhammad Mughrabi. Look how the New York Times bury such stories: "In Gaza, a Palestinian medical official said Tuesday that a 10-year-old boy had been killed by Israeli Army fire during an incursion near the central town of Deir al Balah." PS How can one respect George Soros when he seeks the wisdom of this guy. PS I am on the road so I don't have access to the picture of Jumblat drinking Mattah. "Speaking days after avoiding the arrest, Almog told the Guardian he was advised not to leave the plane by the cabin crew. "I don't know how he [the military attache] found out but I am glad he did. It was also fortunate that I was flying with El Al as they are loyal. I don't know what would have happened if I had been on a British Airways flight."" "The known fact that settlements are built on private Palestinian lands combines all too well with the general civic and institutional Israeli perception to the effect that Palestinian lands that are not privately owned, or that lack proof of private ownership, belong to the Jewish people in Israel and the Diaspora." The Iranian president is a friend that the Palestinian people don't need or deserve. "The Woessners found that liberal students have values and interests that point them to careers in academe, while most conservative students do not. "The personal priorities of those on the left," the Woessners conclude, "are more compatible with pursuing a Ph.D.""
I will speak tonight at Cal Poly at San Luis Obispo. The topic is Iraq. 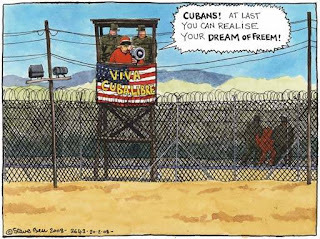 What do I do when I read colunmists in Saudi media complaining about lack of freedoms in Cuba? What do you do? I never liked Castro: not even during my Marxist-Leninist days. Russia is trying to form an organization for natural gas producing countries. Not to be outdone, Arab countries are trying to form an organization of hot air producing countries. Dr. Bush. Dr. George W. Bush. Al-Arabiya TV introduced a segment on Bush's trips in Africa by saying that "President Bush went to personally inspect the health conditions of Africans." I kid you not. Did I not tell you that Al-Arabiya TV is even more "fair and balanced" than Fox News? When Abu Mazen was meeting with Olmert, three Palestinians were killed (according to As-Safir). Oh, no. Not again. Not Danish cartoons. Ayatullah Muhammad Husayn Fadlallah sent an official letter to the Danish government regarding Danish cartoons (not pastries). He express his concern that "some Jewish sides that are linked to International Zionism" may be behind Danish cartons. Lebanese novelist, Suhayl Idriss, is dead. In addition to his novels, he had lexicographic contributions and founded Al-Adab magazine. I met him through Samah a few times but did not know him. I offer condolences to Samah, Kirsten, Rana and the rest of the family. I recommend the short autobiography that Suhayl wrote: it was rushed in the second part but the first part was very revealing and frank. I just received the book by George Malbrunot, Les Revolutionaires ne meurent jamais. I can tell you that Malbrunot did not know much to do this book. The questions are very general. But I will say more later. There is a picture of a young Jalal Talbani with George Habash: when the former used to conduct operations for Wadi` Haddad. (I don't like seeing pictures of Habash with Hafidh Al-Asad, or Saddam Husayn or Mu`ammar Qadhdhafi). PS For purpose of full disclosure. My opinion may be biased here because I was supposed to do a book on him but Habash told me that his wife did not approve. So there. 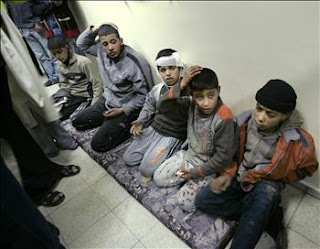 "After September 11, 2001, Senator Clinton called the education policy of the Palestinian Authority "child abuse."" I am just puzzled by those who manage to pledge allegiance simultaneously to Saudi Arabia and Iran. People like: Khalid Mish`al, `Abdul-Amir Qabalan, etc. Today, Saudi ambassador in Lebanon explained the Saudi travel advisory to Lebanon. He said that all oil princes will be directed to alternative brothels in Europe and other parts of the region. For details, contact Prince Nawwaf Bin `Abdul-`Aziz (he almost died in a hotel room in Phoenicia Hotel in Beirut in 2002). Comrade Khalid warns all Lebanese leaders: those who engage in a civil war will officially become warlords. For real progress in the Middle East, for liberation and for gender equality, all religious states have to be abolished: Saudi Arabia, Israel, and Iran. And Dubai has to be made into a socialist republic with Sheikh Mo made to take every class taught by Judith Bulter. George Habash never visited Iran in protest of the regime's oppression and persecution of leftists (under the Shah and under the Islamic republic). I often praise New TV--one of the few non-sectarian media outlets in Lebanon. And then they air a stupid report. Today, they aired a report that JFK was killed because he was going to end Israel's nuclear quest. For those who asked. I have not posted poetry or art in a while. I just don't have time. I barely have time to post anything. Like recently: Lebanese poet Raji `Ashquti died. He was a progressive and wrote in Lebanese accent. I like his volume Mahrajan Tahta Ash-Shams. It begins thus: "Where are the kings of the universe...Those who were here...."
"The letter adds that while disagreements on policy exist, there is no disagreement regarding the special relations between the U.S. and Israel: “We have worked with Rob closely over the years and have no doubt he shares this view and has acted consistent with it.”"
I am reading the autobiography of Marwan Kanafani. It is essential for anybody interested in the history of the PLO and the role of the lousy Yaser `Arafat. Kanafani is a good writer although I don't like his politics. He likes Arafat although he unwittingly shows up the petty, petulant, vindictive, autocratic, deceptive, and unprincipled sides of Arafat. We underestimated Anwar Sadat. All of us did. His impact on Arab politics, I now claim, has been bigger than Nasser. I will be writing an article on that soon for Al-Akhbar. He really changed a lot about Arab politics, from Maghrib to Mashriq. (Oh, and there is no one I detest in contemporary Arab politics than this Nazi). Somebody should youtube it. Riyad Qubaysi of New TV aired a great report yesterday on the rhetoric of war in the March 14th camp. Did you see Abu Mazen and Ahmad Quray` greeting Olmert? You have to see the footage. It is one the same day that yet another Palestinian was killed by Israeli occupation forces. "Damage to several undersea telecom cables that caused outages across the Middle East and Asia could have been an act of sabotage, the International Telecommunication Union said on Monday." From the front page of the Hariri, rag, Al-Mustaqbal. Look at him. Just look at him NOW. "Saudi Shi'ites have asked the authorities to scrap plans to settle Sunni Muslim Yemenis in southern Saudi Arabia to change the demographic balance in an area where they are the majority." You have to say this about him--as much as I think that his role in '67 war unforgivable: Only the pre-1967 Nasser would have been able to effectively deal with Saudi propaganda and plots. Convicted Lebanese war criminal, Samir Ja`ja` (Ga`ga` in Egyptian accent), will be visiting Washington, DC next month. I wonder if the US press will notice that a serial car bomber has received an official invitation from the same administration that has declared a war on terrorism. People are very nervous in Lebanon. They have every reason to be. They don't know if a civil war or an Israeli war will engulf their country. I have a hard time predicting what will happen. Anis Naqqash thinks that those who are edging toward civil war don't have the means. But that could easily change, as we have seen in the history of the last civil war. Doha Shams on the disgraceful "document" by Arab information ministers for the control and censorship of Arab media. (This is the full text of the document: Orwell would have included it in 1984). Arab politics is now in the hands of Sheikh Mo. You can go to sleep now. "As for Brzezinski, Obama's circle is saying he does not advise the candidate about Israel-related issues." What is behind the Saudi travel advisory to Lebanon? 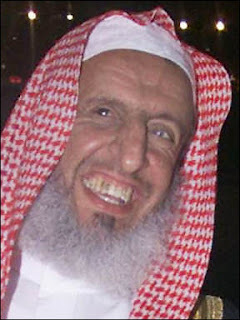 Does the Saudi government know of some influx of their exports of Bin Ladenites to Lebanon? Or do they wish to cloud the situation and hope that conflict between the factions only get worse? And this is not a coincidence. The tone of Walid Jumblat dramatically changed after his visit to Riyadh and his meeting with the Saudi king. "Senior Pentagon officials are using a classified Army study on the 2006 war between Israel and the militant group Hezbollah to retool the U.S. military's combat strategy for future wars." AlJazeera net asked me to comment on the recent plan by Arab information ministers to restrict freedoms of the TV satellite stations. Here, is my response. (They printed it as is, including my reference to the impact of Saudi-Qatari reconciliation). Flash. The (Saudi-controlled) Muslim World League has spoken...against...Danish cartoons. "He said Mughniyeh had prepared a variety of “spectacular” attacks to be executed by Hezbollah if one of its top leaders was assassinated. These were now being dusted off and updated. On the day Mughniyeh was buried, Ehud Olmert, the Israeli prime minister, summoned Dagan from his cottage in Galilee to Jerusalem. “It was a one-on-one meeting,” said a source. 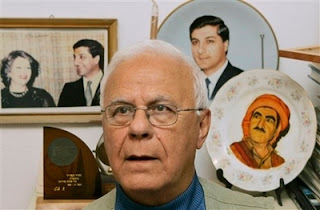 But it is believed that Dagan was complimented by his boss and told that he would stay as head of Mossad until the end of 2009." "Civilian militia groups that have sided with US troops in the battle against al-Qaeda in Iraq are threatening to withdraw after three fighters were killed in a suspected friendly fire incident." "About half were set up in Europe, officials said -- in part to put the agency in better position to track radical Muslim groups there, but also because of the ease of travel and comfortable living conditions. That consideration vexed some CIA veterans. "How do you let someone have a white-collar lifestyle and be part of the blue-collar terrorist infrastructure?" said one high-ranking official who was critical of the program."" Look at this headline: "U.S. military says Iraqi civilians fired on troops." Somebody needs to find me the transcript (NOW). The answer that was given by US Director of National Intelligence Mike McConnell on the assassination of `Imad Mughniyyah on Fox News Sunday today revealed something--more than he wanted to reveal, I felt. ("First, the assassination of terrorist Imad Mughniyeh this week — did the U.S. have anything to do with that? The last line of Jumblat's passage from the speech was not accurately translated. He said that "which we will take from you" (not launch on you). You have to read this account of a speech on the Middle East in the New York Times. What I like about the New York Times is that it does not even try to be "fair and balanced" when it comes to its coverage of the Middle East. Sectarian politics: worse than disunity is sectarian solidarity. 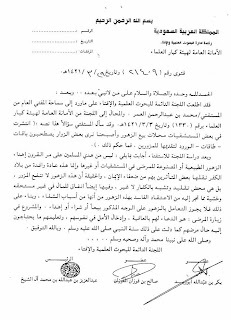 Read the text of this lousy letter from the Lebanese state's most senior Shi`ite cleric, `Abdul-Amir Qabalan, to Iraqi puppet prime minister, Nuri Al-Maliki. Notice that he called on him to seek the guidance of the lousy Ayatullahs in Najaf--who are still worried about Chess but not about foreign occupation--and to combat "corruption and terrorism" but not foreign occupation. In fact, he did not use the word occupation in this lousy letter. So according to Shi`ite sectarian parties in the Middle East, foreign occupation is undesirable except when Shi`ite sectarian puppets are installed by occupation forces. This explains why you will not hear one word of criticisms of the Iraqi puppet government in Hizbullah's propaganda outlets. So if Dahlan were to convert to Shi`ism, would he obtain the support of Qabalan? "In 1986, there was one mosque for every 6,031 Egyptians, according to government statistics. By 2005, there was one mosque for every 745 people — and the population has nearly doubled." Conspiracy? What conspiracy? This is the most blatant element of the conspiracy and of the influence of the US administration in Saudi propaganda outlets. Look at this article in (popular sleaze website) Elaph: it does not even have a byline. It begins like this: "The US government, in both of its branches--the legislative and the executive--has been striving to strengthen the programs for the spread of democracy around the world...." This is something. (The website on its anniversary bragged that I criticized them). Nuclear fatwawawawa: Shaykh of Al-Azhar, took time from his busy schedule of book burning, to proclaim that any state may obtain nuclear technology provided it used for "good." Much of the leaks in Syrian and Hamas media are pointing to a role by Jordanian mukhabarat in the assassination of `Imad Mughniyyah. Did people notice that Walid Jumblat referred to the Hariri "dynasty" in his speech this week? Ibrahim Al-Ja`fari, former puppet prime minister of Iraq, told AlJazeera TV that Iraqi military commanders and "academics"--kid you not--will decide the duration of US presence in Iraq. (Nobody in the news spoke about the ties between Ibrahim Al-Ja`fari and `Imad Mughniyyah during the Da`wah years). I have to run: there is breaking news on Al-Jazeera TV on...Danish cartoons. "Arab families living in Israel are four times likelier than their Jewish counterparts to live in poverty, according to a report published Saturday by the Mossawa Advocacy Center for Arab Citizens in Israel." Abu Mazen's Minister of Demagoguery, Sa'ib `Urayqat, said on AlJazeera (Arabic) TV that the "American referee" should determine who is violating the agreements between Israel and the Palestinians. (After the interview, AlJazeera resumed its wall-to-wall coverage of Danish cartoons). Amal militia and Hariri militia are fighting in the streets of Beirut. When you watch such a clash between those sectarian forces, you understand how Henry Kissinger felt about the Iran-Iraq war. You don't want any side to win, or you want both sides to lose. Make no mistake about it: we live in colonial times. Notice this headline in the New York Times: "U.S. Struggles to Tutor Iraqis in Rule of Law." What is up with AlJazeera? They just had a discussion on operations to "Christianize" Algeria by Western intelligence agencies. I kid you not. Why am I on the email list of the Syndicate of Dentists in Aleppo? Religious demagogues called for demonstrations in Islamabad against...Danish cartoons. Less than 200 people responded. Danish cartoons, for potato's sake. `Ali Hasan Shibli was injured by an Israeli cluster bomb in Halta in South Lebanon. His leg was amputated. PS New TV just reported that this shepherd's son died a few years ago from an Israeli cluster bomb in South Lebanon. An internal Fath memo against Muhammad gangster Dahlan. There is as much religion on Hizbullah TV as there is on Saudi TV. But Syrian TV is largely secular: right now they are playing a song. "The prunes. From where? From where?" This just in. Hariri TV is reporting that Syria was behind the earthquake in Lebanon. Walid Jumblat sent condolences over the death of Tom Lantos. What is Prince Muqrin, head of Saudi foreign intelligence, doing in China? Yesterday, there were clashes between supporters of Amal and supporters of Hariri in several parts of Beirut. There was an earthquake in Lebanon today. In Tyre, of all places. I could see my grandfather's house in one of the TV footage. Watch. Tomorrow An-Nahar and LBC will report that the earthquake is a sign that Lebanon is...special. We still don't know why Qatar decided to withdraw its forces from the UNIFIL in South Lebanon. 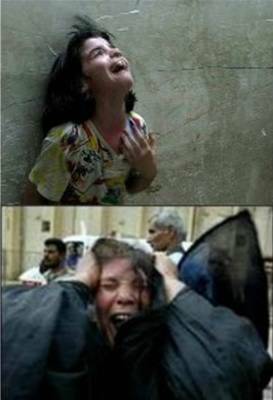 A Syrian person was beaten up in Lebanon. No investigation. Rafiq Nasrallah, an Arab nationalist reporter in Lebanon (he used to work in the Murabitun radio, Voice of Arab Lebanon, during the war, and later became bureau chief for Abu Dhabi TV) was interviewed on New TV. He said some interesting things. Among other things, he said that a team of Russian military experts came to South Lebanon to study the Israeli war on Lebanon of 2006. He also said that some 40,000 to 60,000 men had undergone training with Hizbullah since the end of the 2006 Israeli war on Lebanon. I disagree with his prediction that the Syrian regime would go to war eventually against Israel: Belgium is more likely to go to war against Israel, than this Syrian regime. Ibrahim Al-Amin told Al-Manar TV that there is wild exaggeration of the role and deeds of `Imad Mughniyyah. Syrian state TV is now reporting--wait, I have to listen carefully--that...."The plums. From where? From where?" I am being informed by people who "know" that the secret Saudi-Qatari agreement requires the omission of any news on the BAE corruption scandal on AlJazeera TV. But the agreement does not preclude wall-to-wall coverage of Danish cartoons. Danish cartoons, for potato's sake. My article in Al-Akhbar: "Who killed the Rabble in the Streets of Mar Mikha'il [in the suburbs of Beirut]"
There is a breaking news bulletin on Aljazeera TV: a Danish cartoon has just been printed. Hamas protesters took to the streets. Another scoop for Robert Fisk. So Robert Fisk was passing through London Heathrow airport. He saw this man singing aloud this song: "The plums. From where. From where. The plums. From where. From where." The man then approached Fisk and introduced himself to Fisk: Hi. I am Ayman Adh-Dhawahiri. Please interview me for the Independent. Fisk obliged although he was very busy because he was on his way to interview Abu Nidal (the latter had to come back from death for the interview). Syria announced that it will form a special investigation committee to find the fact regarding the assassination of `Imad Mughniyyah. Syria media are speculating that the investigation will reveal that Syrian TV was playing: "The plums. From Where? From Where?" song at the same time of the assassination. Finally. The queen of Jordan finally commented on the regular Israeli killing of Palestinians. She urged Palestinians to avoid...reckless driving. Amer believes that a large number of comments written on Arab news sites, especially Al-Arabiya and Elaph, are written by members of Arab intelligence services.